Recording Academy Philadelphia Chapter members and Drexel University students gathered at Drexel’s Bossone Research Center for GRAMMY SoundTables®: Behind the Glass with Jimmy Douglass and Justin "Just Blaze" Smith. Pictured L-R: Sr. Executive Director, Producers & Engineers Wing Maureen Droney, producer/engineer Jimmy Douglass; producer Just Blaze; producer & Philadelphia Chapter President Ivan Barias, producer Phil Nicolo,; engineer Mike Tarsia, Executive Director, The Recording Academy Philadelphia Chapter Mark Schulz, mastering engineer Ryan Schwabe. Photo Courtesy of The Recording Academy/Lisa Lake Photo Design/Lisa Lake. Photographed by Lisa Lake. ©2012. SANTA MONICA, Calif. (May 30, 2012) — As part of its ongoing mission to promote both sound quality and the overall art and craft of recording music, the Producers & Engineers Wing® of The Recording Academy® staged a series of events this spring that brought experts in music production to audiences in key markets including Chicago, Dallas, Los Angeles, Miami, Nashville, Philadelphia, San Francisco, and Washington D.C. These unique events are part of a longstanding commitment to share the invaluable experience of leading record producers, engineers, mixers and other audio professionals with the P&E Wing's growing constituency throughout the U.S.
• On April 4, GRAMMY SoundTables® brought legendary engineer Al Schmitt to Chicago for an unforgettable night of education, anecdotes and great music with Behind The Glass With Al Schmitt. Moderated by Shure Inc.'s Mark Brunner, the event saw Schmitt provide the enthusiastic audience with priceless insights from his long and storied career, including tips for helping recording artists achieve their best performance and advice on maintaining longevity in a recording career. • On April 5, the P&E Wing partnered with Musicians Institute in Los Angeles for A Conversation With Don Was. The multiple GRAMMY® Award-winning producer – including Producer Of The Year in 1995 – whose eclectic discography includes the B-52s, Garth Brooks, Bob Dylan, Al Green, Carly Simon, and the Rolling Stones, spoke to a packed house eager to hear his stories and advice. Was reflected on his early days as a session bassist, his struggles with the club circuit, how he learned to trust his instincts as a producer, how he is adapting to his new role as head of famed jazz label Blue Note Records, and finally further delighted the audience by closing with an impromptu acoustic performance. • Also on April 5, on the other side of the country, Recording Academy Philadelphia Chapter members and Drexel University students gathered at Drexel's Bossone Research Center for GRAMMY SoundTables: Behind The Glass With Jimmy Douglass And Justin "Just Blaze" Smith. A full house turned out to enjoy the conversation between two of the industry's most active engineer/producers, moderated by P&E Wing Sr. Executive Director Maureen Droney. Douglass and Smith shared candid observations on the philosophy, psychology and art of record production, then answered questions and mingled with the audience at a post-event reception. • On April 10, The Recording Academy Nashville Chapter and the P&E Wing hosted GRAMMY U: In The Studio at the legendary Nashville facility previously known as RCA Studio A/Javelina Studios and currently operated by respected recording artist Ben Folds. GRAMMY U® students from schools throughout Nashville got up close and personal as producer/engineer Jon Randall Stewart and the band 18 South recorded two tracks and explained the process. Attendees were able to sit among the musicians in the studio during tracking as band members discussed how studio roles interact throughout the recording process. "This is just a small sampling of our events during one week," said Maureen Droney, Sr. Executive Director of the P&E Wing. "P&E Wing membership overall is characterized by the willingness of so many of our members to share their knowledge and experience with others whose passion for music matches their own. It is truly an incredible community: a nationwide network that all year long, month after month, shares information that helps pass the torch forward, all in the interest of creating great music." Photo Caption: Recording Academy Philadelphia Chapter members and Drexel University students gathered at Drexel’s Bossone Research Center for GRAMMY SoundTables®: Behind the Glass with Jimmy Douglass and Justin "Just Blaze" Smith. 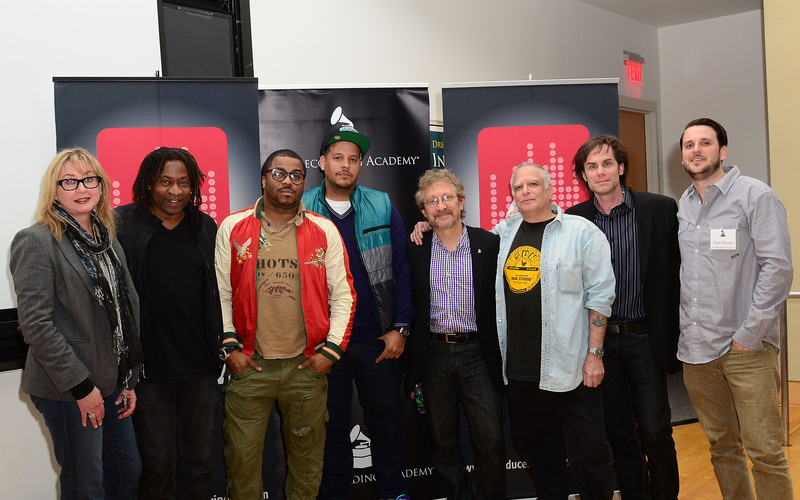 Pictured L-R: Sr. Executive Director, Producers & Engineers Wing Maureen Droney, producer/engineer Jimmy Douglass; producer Just Blaze; producer & Philadelphia Chapter President Ivan Barias, producer Phil Nicolo; engineer Mike Tarsia, Executive Director, The Recording Academy Philadelphia Chapter Mark Schulz, mastering engineer Ryan Schwabe. Photo Courtesy of The Recording Academy/Lisa Lake Photo Design/Lisa Lake. Photographed by Lisa Lake. ©2012. Established in 1957, The Recording Academy is an organization of musicians, producers, engineers and recording professionals that is dedicated to improving the cultural condition and quality of life for music and its makers. Internationally known for the GRAMMY® Awards — the preeminent peer-recognized award for musical excellence and the most credible brand in music — The Recording Academy is responsible for groundbreaking professional development, cultural enrichment, advocacy, education and human services programs. The Academy continues to focus on its mission of recognizing musical excellence, advocating for the well-being of music makers and ensuring music remains an indelible part of our culture. For more information about The Academy, please visit www.grammy.com. For breaking news and exclusive content, follow @TheGRAMMYs on Twitter, like "The GRAMMYs" on Facebook, and join The GRAMMYs' social communities on YouTube, Tumblr, Foursquare, GetGlue, and Instagram.